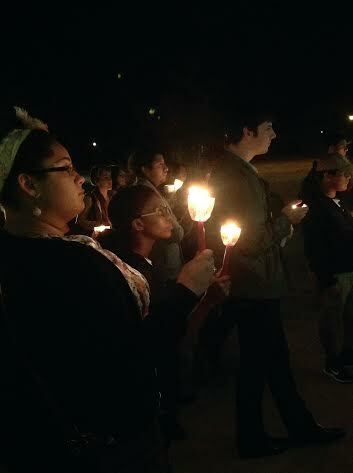 Students gather in a candlelight vigil for missing students in Mexico. Several student organizations hosted a candlelight vigil in honor of the 43 missing students in Mexico on Dec. 3 in front of the Student Union Building at Armstrong. Amnesty International, HOLA club, Hispanic Outreach and Retention at Armstrong (HORA), Lambda Theta Phi Fraternity and Phi Iota Alpha Fraternity organized the event. The purpose of the vigil was “to raise awareness of the 43 Mexican students who have gone missing,” Lambda Theta Phi Fraternity Induction Officer Rolando Zenteno said. “Students in college to be teachers were protesting the mayor of local cities and he sent police to turn the 43 students to a local gang.” The students have not been heard from since and are presumed dead. President of HOLA and member of Phi Iota Alpha Fraternity, Josmar Trejo, began the vigil by describing the situation to the crowd. “They were college students just like us, trying to make a name for themselves,” he said. With lit candles in hand, the crowd participated in a moment of silence and were given the opportunity to pray if they so chose. Videos portraying the riots and outrage in Mexico were also shown. “I hope that people are more understanding of the issue and put faces to a name,” member of Hermandad de Sigma Iota Alpha Incorporada, Stephanie Molina said.